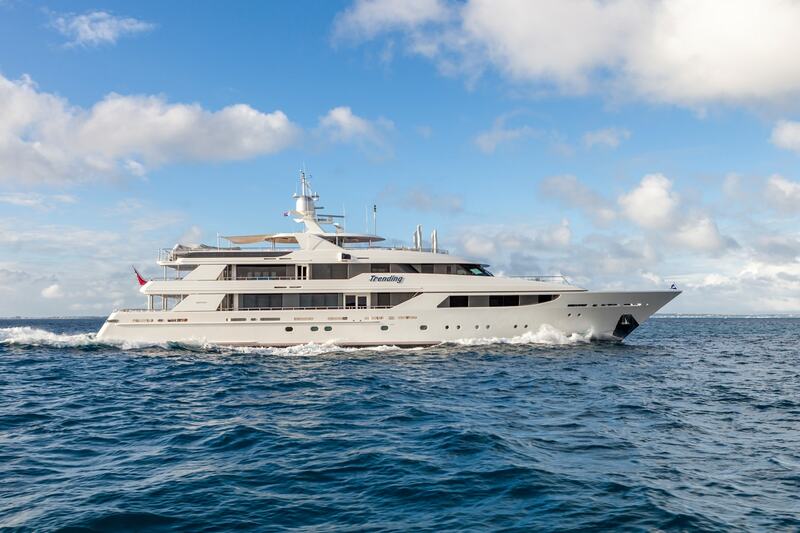 Trending is a stunning luxury yacht, available for charter following a $4M+ refit in 2015-16. A superb six-stateroom vessel, Trending was highly customized by her owners, experienced yachtsmen and charterers for over 20 years. The interior and exterior were redecorated to accent light, neutral colors focusing on ease of use and comfort. Trending is sophisticated yet open and airy with oversized windows and full-length glass doors and subtle ocean-inspired decor. Bar and dining areas are located on her three decks. State of the art audio/video and wireless systems enable entertainment throughout the yacht. Beautifully-appointed staterooms each with a luxurious bathroom are featured in this first-class floating resort. The lavish Master Suite is located on the Main Deck forward, offering a private office with plush seating, and an exquisite onyx-clad bathroom with a whirlpool tub and separate shower. The VIP stateroom is uniquely situated on the Sky Lounge Deck and features a private patio, perfect for morning coffee or tea. The Sky Lounge aft is furnished with a granite-topped bar for six, and casual seating for twelve. Beyond, the newly extended Sky Lounge Aft Deck offers alfresco dining for twelve in total privacy. A large therapeutic hot tub surrounded by sun beds can be partially or fully-shaded. A wide selection of the most popular water toys are guaranteed to maximize your exploration in the sea or ashore. The sizable 37′ towed tender “TRENDER” (new in 2015) and outfitted with all the ammenities for a memorable day in the water: an air-conditioned cabin, with bathroom and shower, kitchenette and built-in grill, fishing gear, Bluetooth stereo and top-of-the-line electronics including night vision and joystick controls.